We had a great game drive this morning. 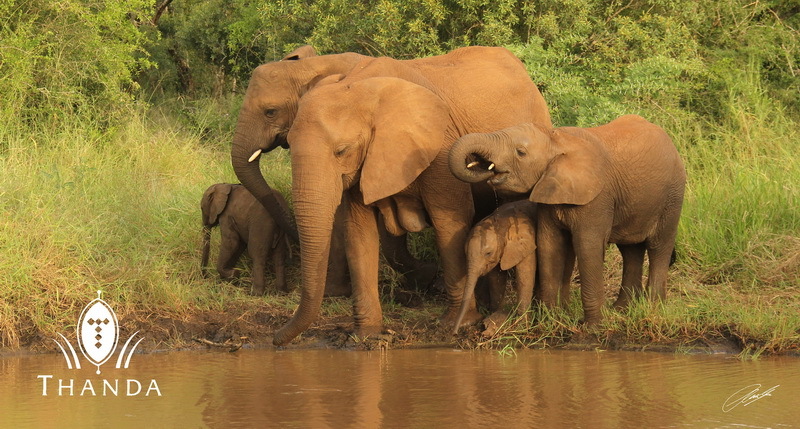 After tracking for less than half an hour we found the breeding herd of Elephants feeding in thick bush. 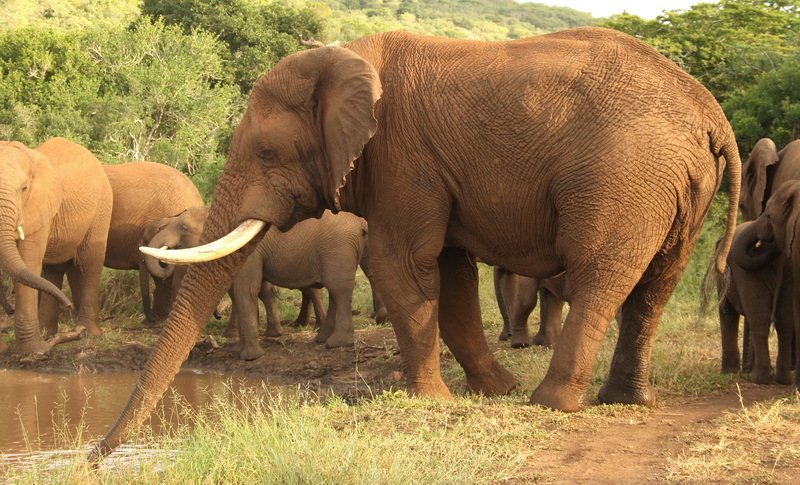 We watched them crossing the road in front of us and thought they might go to drink at a nearby waterhole. And we were right. The whole herd was having a drink. 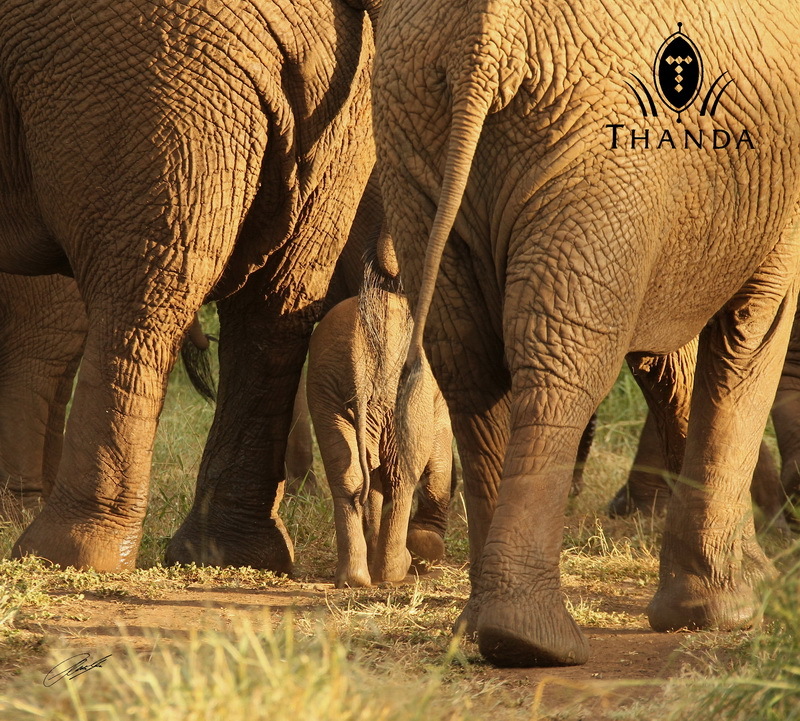 The first picture shows the Thanda matriarch (she has no tusks) with another adult cow, one older calf and the two youngest members of the herd. 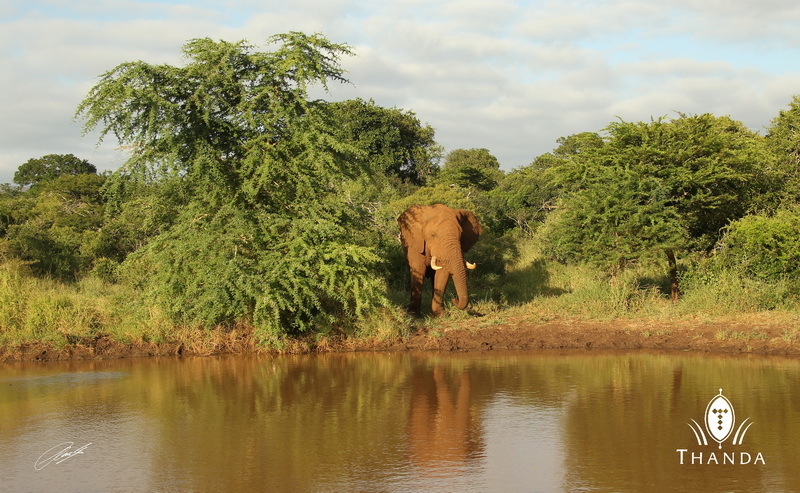 The next picture shows one of our oldest bulls drinking (he is currently in musth as indicated by the back legs wet from dribbling urine and the running glands on his head). The herd is very protective of their young. In the last picture you can see on of the little ones “disappearing” between the females. We finished off this Thanda morning game drive with coffee and cookies in the bush! I’m sure the little one feels safe and secure as he walks with the giant adults, but I probably would be feeling a little claustrophobic from this view. Thanks for sharing the info about bull having the running glands on his head . I did not know this. Thanks again. The photos are wonderful! Seeing elephants so close up never ceases to impress me. As a wildlife artist I particularly view the details; their skin is crinkled with weathering. Where would we be without lotion? 🙂 Seriously though, these are such amazing creatures! Someday I AM coming to Africa, I alsmost have enough money safed for my Canon camera. Thank you for sharing Chris. I went to Phinda in 2006 for 3 days – I will never forget it. Absolutely the best experience ever. You were there on one of your trips and we looked at some of your photos. I’m delighted to see that you are now in SA permanently and that I can see some of the day to day game drive experiences!